It's been an incredibly tough three buckless seasons! Letting them go and watching them grow is tough, and for me it's even tougher to continuously get nocturnal giants on the cams and barely ever have sightings. I have, in the past five years of leasing this property, seen some of the biggest deer of my life, mainly on camera or past or before legal light. So, this year was no different, I got a couple monsters on the cams, but always at night. My birthday was November 1st, I hunted all day and didn't see much. Sunday my parents wanted me to come over for dinner. Anybody, including them, that know me know I'm hard to commit to anything during daylight hours from October to January... especially during the rut. Well, I commited, and went out Sunday morning and saw nothing but a fawn. I got back to the house around 11:30 am and decided to hang my new Cuddyback near a stand I hadn't used yet this year. As I drove the 4-wheeler back to the house, I found myself fifity yards and face to face with a giant. I kept driving and he kept watching. I got about 150 yards away and stopped to investigate (and wipe the drool from my mouth) . I noticed he had a doe locked down in some thick stuff. So I headed back to the house to devise a plan. Unfortunately I could barely think let alone concentrate on the perfect kill plan. Either way, I was going to have to decide, family dinner or kill a giant. I'm a new father, and it does have me thinking differently, so I decided I would go to dinner. On our way to my parents I was taking a slow drive and glaring in the woods, and of course, who do I see trying to cross the road but the giant ! I quickly hopped out of the truck and scared him back into the woods. I could barely keep myself together. Since then I have been a wreck. One thing on my mind, the giant. We have all been there ! I had Wednesday off and was in the woods all day except a thirty minute crap n sandwich break.... only saw two small bucks all day. Hanging my head and thinking I lost my one shot at the giant, I still kept my fire and was in the stand Thursday morning by 5:30 am. I saw nothing but a button buck all morning until 9:20 am, when I caught a flash of brown followed by a chunk of antlers. He was on a mission, head down through the golden rod, making his own trail as he went. I really only had one small window to shoot, so I drew back and by the time I was ready to stop him he was hidden under six foot of swamp weeds... I let down the bow. He kept coming, but slowly, heading for the thick stuff and into never never land. I picked out a spot under some apple trees that would be my "Hail Mary" spot. He kept coming... I stopped him and let the rage extreme fly...lumenok glowing. I saw the arrow hit him center mass, good height. Ugh! Oh, no! I could not tell you what was happening to me for the next half hour. I decided to wait in the stand. Marginal shot, maybe, but was hoping for liver and hoping that nasty extreme would do work on him. So after an episode of tremors and shaking like a crack-head, thirty minutes had passed. I got down and got blood ! The giant had an arrow threw him ! I found a huge spray of blood on impact and could see blood at least 10 yards up the run he took. Being cautious I decided to give him two hours. I waited the two hours, when I started tracking I could not believe the blood trail. He went a total of 80 yards and piled up. It was a liver/gut shot, but it worked, and I am one happy hunter. The best part is that after all the exciment calmed down I realized he's not even the big guy I have on the trail cam! I will be greatful for him, but my goodness what a great season I could have with both! Who knows? Who cares? The giant is dead and I am still in disbelief! If you just read all of this, thanks, and good luck to you !! Let 'em go and watch 'em grow !! 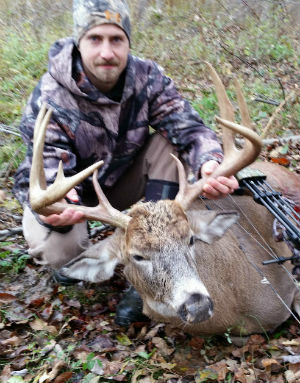 Andrews buck sports a 19.5" inside spread with 10.5" G2's. The Erie County buck, nicknamed "The Vamp" was aged at 6 1/2 years old and taken on 11/8/2014.